A 1.1-megawatt solar array is sited alongside a wind farm near Garden, Michigan. With the declining costs of solar energy and Michigan’s increased renewable portfolio standard, small townships throughout the state are confronting challenging land-use questions amid the increase in large-scale solar proposals. Reactions have varied from blocking utility-scale solar projects until local zoning rules are adopted to accommodating developers as they amass land for projects that require hundreds of acres. But in most of these cases, there were no local regulations permitting large-scale solar projects when developers came. Local planners are now revisiting their zoning rules and figuring out where large-scale solar projects could be located. It is similar to the way communities first responded to wind development here roughly 10 years ago, though solar brings a unique set of land-use questions. Michigan is home to nearly 1,300 townships that are typically 36 square miles each, most of which have their own local zoning rules. John Kinch, executive director of Michigan Energy Options, said the state has doubled its solar capacity over the past year, noting the pace at which land-use considerations are also growing. Across the state, multiple large-scale projects have been proposed or are at different stages of development. These include plans for a 1,900-acre, 112 megawatt (MW) project at a wastewater treatment plant in west Michigan; a 550-acre project in St. Joseph County near the Indiana border; a 1,000-acre, 100 MW project in the U.P. ; and a 550-acre, 65 MW project in Eaton County near Lansing. In each instance, local governments revised their ordinances or are currently in the process of doing so. Other areas of the state have taken a different path. For example, Huron County in the Thumb region enacted a moratorium on commercial solar projects in May. After recent contention over the large amount of wind development that’s taken place there, local officials sought to press pause before catching up to solar after-the-fact. In contrast, Forsyth Township in the Upper Peninsula just south of Marquette adopted solar regulations earlier this year. Kansas-based Tradewind Energy, along with Marquette-based developer Rich VanderVeen, are planning a 100 MW project on forested land near the former KI Sawyer military base. Rebecca Stachewicz, the township’s assessor and zoning administrator, said local officials wanted to be accommodating in order to bring investment to the impoverished area. The township’s solar regulations cover rooftop to large-scale ground-mounted solar projects, requiring site plan reviews on location and setbacks. The township researched other municipalities and worked with the developer on understanding the issue, she added. However, Forsyth’s geography and economic factors make it unique, she added. Meanwhile, township officials in St. Joseph county in southwest Michigan are just beginning to look at how their zoning rules might accommodate solar. 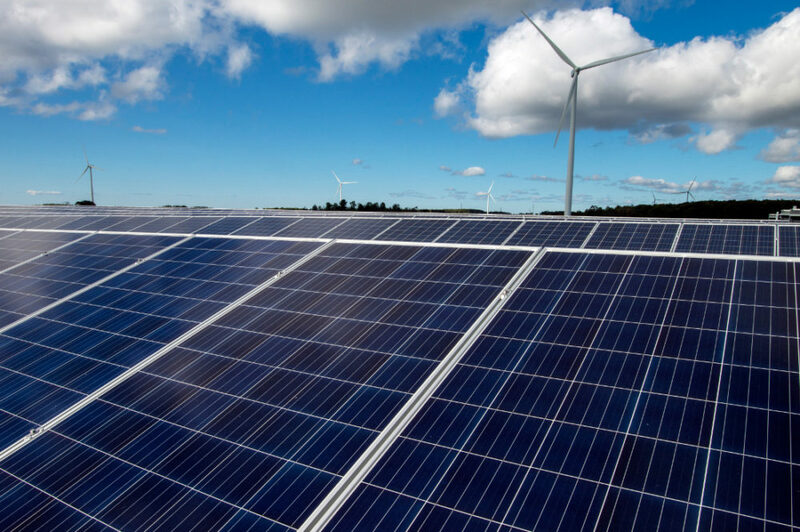 Minnesota-based Geronimo Energy has been looking to acquire nearly 600 acres in Nottawa and Mendon townships for a solar project. Some local residents have also voiced farmland preservation concerns with this project. Peterson says he plans to be “even-handed open-minded” about the project. While there are farming concerns, a project of that scale has clean energy benefits — “environmentally a pro,” he said — and could be a new source of revenue for local governments and schools, as is the case with a major solar project DTE unveiled recently near Flint. “We’re going to take some time to review it,” Peterson said. Starting this week, Neumann and other staffers with MSU Extension begin an outreach effort to local officials with guidance and workshops on how to plan for large-scale solar projects. Those efforts are likely to continue into 2018, said Harmony Gmazel, also an educator with MSU Extension. “You can come to these sessions without much prior knowledge about solar energy, then jump into best practices for zoning ordinance language concerning solar,” Gmazel said. In several cases, proposed commercial projects would span agricultural land — an idea getting pushback from some local residents who want to preserve it for farming. Neumann also said there was some opposition to the Forsyth Township project because it was clear-cutting forested land, which could also be considered a commodity there. However, Forsythe Township supervisor Joe Boogren disputes that account. Neumann has been a proponent of using marginal lands — for example, properties that aren’t prime farmland, such as rights-of-way along highways, brownfields, landfills or areas near airports — for large-scale solar development. The MSU Extension workshops will encourage municipalities to look at an inventory of land within the jurisdiction that might be suitable for solar. “If that assessment has been done beforehand, there probably can be some ways to streamline the development review process,” Neumann said. However, he said there “may be some different ways” of using agricultural land for large-scale solar, such as allowing livestock to graze there or harvesting crops that could be grown beneath panels. Kinch, of Michigan Energy Options, said the issue is twofold: If local communities are interested in solar development, they should prioritize brownfield or other marginal lands first. Earlier this year, Michigan Energy Options mapped brownfield sites in the Upper Peninsula that could be repurposed for solar. “The other side is: If I’m a private landowner, if I’m a solar company that wants to put solar on the property and a utility wants to buy it, I’m not sure at the local level what can be done about that,” he said. This is the scenario for at least one mid-Michigan farming family. Geronimo Energy has floated plans for a 65 MW solar project in Eaton County, an agricultural region just west of Lansing. While the proposal has generated pushback from some residents over farmland preservation, not all farmers are opposed. John Forell — who grows crops like corn, soybeans and wheat — wants to lease about 400 acres of his property to Geronimo. Forell, 50, said he was approached by the company about a year ago. “We’ve been enduring over three years of commodity prices that are at or below break-even,” Forell said, adding that he’s “always competed against developers” over preserving farmland. “After long consideration and a lot of family discussions with younger siblings who will be the heirs to the property, we decided economically it was probably a good fit. It will preserve open space on the land and if in 25 or 30 years they decide solar is no longer the best use and food production is more valuable, it could easily be converted back to food production. However, he said the township is considering zoning regulations that would limit large-scale solar development to industrially zoned areas after hearing concerns from local residents. (“Yet they will allow wind energy” on agricultural land, he added.) A public hearing is scheduled on the issue next week. “They’re going to take away a person’s property rights to appease people people that don’t want it,” Forell said, adding that he believes large-scale solar will ultimately be limited to industrial areas. He also counters the farmland preservation argument with the idea that solar itself is a way of farming. After all, he said, much of the corn he grows is used to make ethanol. Correction: An earlier version of this story incorrectly gave the last name of Michigan State University Extension educator Harmony Gmazel. The article has been updated to include a comment from Forsythe Township supervisor Joe Boogren.